Russian Foreign Minister Sergey Lavrov said Sunday that leaks of U.S. President Donald Trump's "Deal of Century" on Mideast peace are worrying. 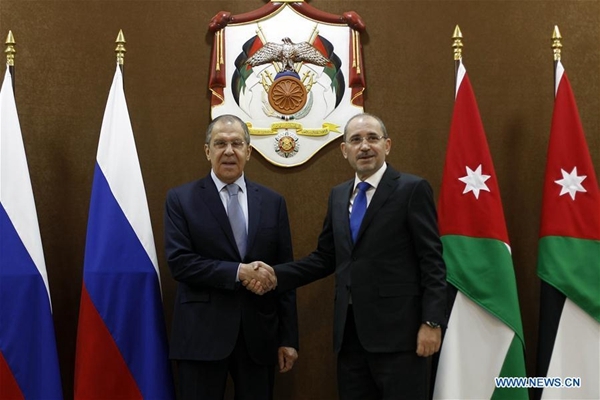 Lavrov said Russia does not have information about the deal, but the leaks of some of its details are worrying, at a joint press conference in Amman with Jordanian Foreign Minister Ayman Safadi. "All unilateral attempts will not lead to anything good. We are concerned with the U.S. decisions on the Golan Heights and Jerusalem and the negative U.S. attempts including what is known as the Deal of Century," he told reporters. The Russian official voiced his country's support for the two-state solution, condemning the U.S. decision to recognize Jerusalem as the capital of Israel. He called on the international community to abide by the international resolutions in this regard and the Arab peace initiative, adding that the U.S. decision is illegal and invalid. Safadi said that Jordan does not have information about the details of U.S. President Donald Trump's Deal of Century on Mideast peace. The minister said that "we do not know the details of the deal and we do not know what the U.S. will say." Jordan's position in this regard is constant and was reiterated by King Abdullah II of Jordan repeatedly, said Safadi. "The only solution is to end the Israeli occupation and to enable the Palestinians to attain their legitimate rights in line with the two-state solution that ensures their right to statehood and freedom with East Jerusalem being the capital of their state," said Safadi. On Syria, Safadi reiterated the call for a political solution, voicing support for all efforts to restore stability in the country. Also on Sunday, King Abdullah II of Jordan met with the Russian minister and discussed regional developments. The meeting stressed the need for continued coordination to enhance the regional security and stability. Russian foreign minister said that leaks of U.S. president's "Deal of Century" on Mideast peace are worrying.